The ZT410 Series builds on the field-proven reliability of the Z Series™ with advancements in print speed, print quality and connectivity options. These durable printers are designed for years of performance in a wide array of applications. 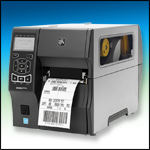 The ZT410 Series printers offer an intuitive icon based LCD graphical user interface and easy supplies loading. All models include standard USB, Serial, Ethernet and Bluetooth® capabilities. The ZT410 Series offers a print width of 4” and print speed of 14ips with 203 and 300 dpi resolutions available. Constructed using an all-metal frame and bi-fold door, this printer is designed to fit well in space constrained environments. Model ZT41042-T010000Z, 203 DPI, 14 IPS Print Speed, 256MB DRAM, 512MB Flash, USB, Serial, Ethernet, Bluetooth, US Plug, EPL Language, ZPL Language. Model ZT41042-T01A000Z, 203 DPI, 14 IPS Print Speed, 256MB DRAM, 512MB Flash, USB, Serial, Ethernet, Bluetooth, 802.11 Wireless, US Plug, EPL Language, ZPL Language. Model ZT41042-T110000Z, 203 DPI, 14 IPS Print Speed, 256MB DRAM, 512MB Flash, USB, Serial, Ethernet, Bluetooth, Peel & Present, US Plug, EPL Language, ZPL Language. Model ZT41042-T310000Z, 203 DPI, 14 IPS Print Speed, 256MB DRAM, 512MB Flash, USB, Serial, Ethernet, Bluetooth, Peel w/ liner take-up, US Plug, EPL Language, ZPL Language. Model ZT41042-T410000Z, 203 DPI, 14 IPS Print Speed, 256MB DRAM, 512MB Flash, USB, Serial, Ethernet, Bluetooth, Peel w/ full rewind, US Plug, EPL Language, ZPL Language. Model ZT41042-T210000Z, 203 DPI, 14 IPS Print Speed, 256MB DRAM, 512MB Flash, USB, Serial, Ethernet, Bluetooth, Cutter, US Plug, EPL Language, ZPL Language. Model ZT41043-T010000Z, 300 DPI, 14 IPS Print Speed, 256MB DRAM, 512MB Flash, USB, Serial, Ethernet, Bluetooth, US Plug, EPL Language, ZPL Language. Model ZT41043-T110000Z, 300 DPI, 14 IPS Print Speed, 256MB DRAM, 512MB Flash, USB, Serial, Ethernet, Bluetooth, Peel & Present, US Plug, EPL Language, ZPL Language. Model ZT41043-T310000Z, 300 DPI, 14 IPS Print Speed, 256MB DRAM, 512MB Flash, USB, Serial, Ethernet, Bluetooth, Peel w/ liner take-up, US Plug, EPL Language, ZPL Language. Model ZT41043-T410000Z, 300 DPI, 14 IPS Print Speed, 256MB DRAM, 512MB Flash, USB, Serial, Ethernet, Bluetooth, Peel w/ full rewind, US Plug, EPL Language, ZPL Language. Model ZT41043-T210000Z, 300 DPI, 14 IPS Print Speed, 256MB DRAM, 512MB Flash, USB, Serial, Ethernet, Bluetooth, Cutter, US Plug, EPL Language, ZPL Language.